When I was in third grade, my older brother and I were at the dime store picking out our Christmas presents. We were supposed to be there buying a kazoo, which I needed for the holiday vocal concert. If you had a kazoo, you could be part of the kazoo band that would accompany one of the songs we were performing. So, clearly, I needed that kazoo. It was a life or death situation. But, as would be expected in the pursuit of a kazoo, my brother and I were distracted by all the shiny new things we wanted. "I want a remote control car!" my brother said. "I want a makeup kit!" I said. And suddenly, we heard a dark and formidable voice say, "Santa is watching you..." I'm sure we screamed or something. But it was just our mother. She had been spying on us from the next aisle and listening to every word we said, probably sorting out gift ideas in her head. She bought me a kazoo, and then giggled merrily about her little joke all the way to the car. Normally, our dad is the practical joker, but something about the holidays makes our mom extra silly. And then she goes insane. It starts with her saying, "I think I'm going to do something completely different this year. But not too much. I don't want all the hassle." Later, she'll add, "Maybe a smaller tree and not so many ornaments." One year, after she said that, we had no fewer than 10 small Christmas trees and one large one in the house. One covered entirely with angels. Another with just bird ornaments. A few with red lights. A few with white lights. And several with no lights at all, so it looked like an evergreen forest had grown up overnight in our living room. "I really don't want to do too much," she insists, washing her hands and dipping them back into the large bowl of papier mache. "As soon as I finish sculpting this Santa Claus, I only have two more trees to decorate. The one for the top of the refrigerator and the one by the toilet. I think I'll paint the bathroom while I'm at it. What do you think of a really light sage? Your dad will probably hate it. You know how he feels about green. But if it's almost brown and compliments the shade of plum in the curtains I'm planning to make tomorrow, maybe he won't say anything." And then she is always quick to add, "But that's it! That's all I'm doing." Five minutes later, there will be the scent of warm glue gun in the air and Mom will be back in her craft room, waist deep in polyfill, making something else. And I'll say, to annoy her, "I thought you said that's all you were doing." To which Mom will respond, "Well, I have to glue the eyes onto this snowman," as if otherwise the poor snowman would have to spend the holidays hobbling around blind. Mom always insists that the best presents are the ones you make. Which is why--after all of the garlands are hung to her liking, the Santa wreath is secured to the front door, and the Baby Jesus is safe in the old wooden nativity--Mom starts planning the cookie plates. Cookie plates are awesome. Mom bakes 3,000,000 different types of cookies, arranges them onto decorative holiday plates, wraps it all up with green Saran Wrap, and then adds a Christmas bow. And there is a good chance that, if you are gluten intolerant, she will make you your own special gluten free cookie plate. When the cookie plates are all wrapped up, she will begin to deliver them to everyone in town. Except for the one for the mailman. She leaves that in the mailbox. The day before Christmas Eve, Mom is understandably exhausted. This is when she announces that she is NOT going to make Christmas dinner this year, and we had all better get used to the idea. She will make some chicken and noodles and put it on the stove, and everybody can just eat whenever they want. "This year," she says, "I'm going to relax. I'm not going to spend the entire week in the kitchen." To which we all just smile and nod because Mom says that every year. We haven't had a traditional Christmas dinner in 20 years, and none of us has ever cared. And so, with her time now freed up to do whatever she wants, Mom gets to work chopping apricots for the rum balls. The night of Christmas Eve, after making sure that the crock pots are all unplugged and all of the stockings are stuffed, Mom will finally sit down and take a break. This is when we watch IT'S A WONDERFUL LIFE. And for the 29th year in a row, I'll get to hear about how Mom got to stay up late and watch that movie with her mother and how it always reminds her of that time. After weeks of decorating, cooking, and sculpting, and in the glow of Jimmy Stewart offering to rope the moon for Donna Reed, Mom will realize that she's exhausted herself again. A week away from work was supposed to be a week of relaxation, and what did she do? She didn't even get to enjoy it. 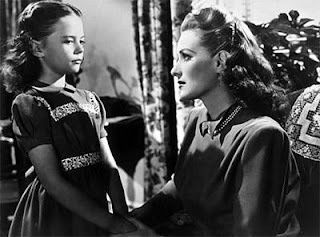 Around the time that George Bailey realizes that he really did have a wonderful life, Mom will decide that next year, she is going to enjoy herself. There will be only a few decorations, and if she doesn't feel like cooking, then by god, she won't. The bells will ring, the credits will roll, and Mom will say, "And that's it. That's all I'm doing." You have to adore Midwestern moms and their loves of crafts and Christmas. And cookie plates, of course. @Katie: I know, right? I made my mom read this last night, and she said, "You make me sound manic!" So, for the record, everyone who reads this, my mom is not manic. Just jolly. Your mom sounds kind of awesome. My mom doesn't cook for Christmas, really. Maybe she used to, but doesn't now. We go to Oklahoma for the big Christmas Eve shingding, where my nice relatives inform me I should consider a job at Fox News. But seriously, I'm oddly looking forward to it. Or at least looking forward to seeing my grandparents and having them go "About time you came to see us!" Once, my mom and my gay buddy and me went to IHOP Christmas Day. Bad idea. Don't do that. It's a mob. OMG, I am totally a cookie plate mom. I had no idea there was a name for them, or that I had joined their ranks. That was really lovely and funny. I love your writing. @SBJ: I'm not a mom, but I'm definitely a cookie plate person. Except, mine tend to come in those holiday decorated Glad Ware containers with a bow on top. Lots of people got that as a gift last year. @lalaland: My mom would be flattered that you think so. @bubblegumculture: I'm so glad you liked it. I love your transitional jokes.